Congratulations to WVVH-TV for receiving “Serving New York” awards for their public service efforts during the year. We especially want to thank you for broadcasting on the air during Hurricane Sandy while the power and other communications services were out. With over 40 Public Service campaigns include, the Clamshell Foundation, ASPCA Horse Rescue Efforts, Riders with Disabilities, American Heart Association’s Heart of the Hamptons Ball, Meals on Wheels, wounded Warriors Soldiers Ride Project, and Kettle Comfort Sponsorship, WVVH-TV has distinguished itself in service to the community throughout the year. “In all the years we’ve been in the business, our phone number hasn’t changed,” said Ernie Schimizzi, who, with his brother, Greg, has had a stronghold on the local television market for almost two decades. 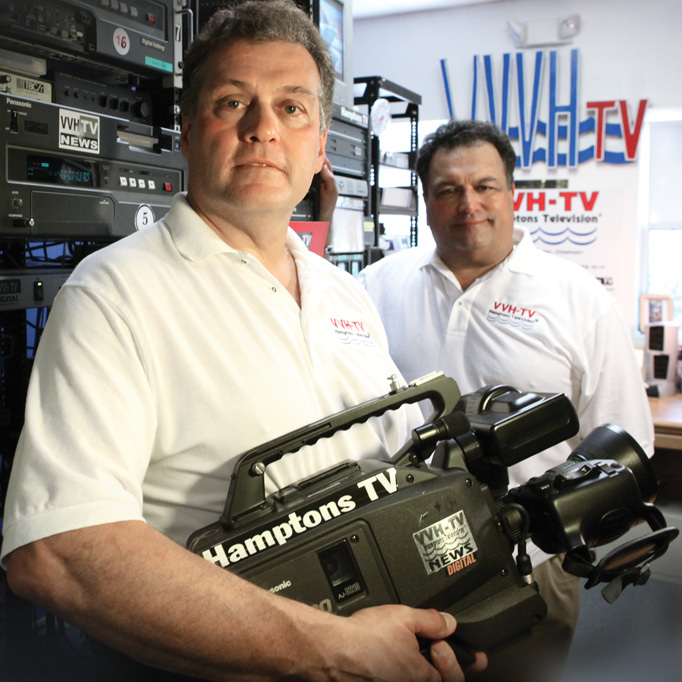 “We’re the last family-owned and run station on Long Island,” he added, referring to WVVH-TV, which can be seen as Hamptons TV on Cablevision Channel 78, on Fios at Channel 14, on YouTube, as a computer Web stream, and even on a smartphone through a recently available app, with an estimated 5 million viewers. “We’re now seen in millions of homes from Montauk to Manhattan,” said Ernie Schimizzi. The Schimizzi brothers grew up in Bensonhurst and were obsessed with the latest innovation — television — from a very early age. “ ‘The Honeymooners’ was supposed to be in Bensonhurst,” Greg Schimizzi recalled. “We grew up convinced that Jackie Gleason lived in one of the buildings on our block.” But it was a trip into the city with their father in 1957 that really sealed their fate. “A Sunday,” said his brother. “And the whole place was open.” After being allowed to wander around the vast production sound stages, they watched the filming of some of the shows, including the “Today” show with Dave Garroway, a legend from the golden age of television. “It was magic,” Ernie Schimizzi said. The photo of the two, standing in front of the studios at 30 Rockefeller Center, still hangs in their office in Wainscott. Their father died only five years later (“from his one and only heart attack,” said Ernie Schimizzi) at the age of 46, and it was up to Mrs. Schimizzi, a dressmaker, to raise the boys on her own. The Schimizzis made the money that they used to buy the station license and start their parent company, Video Voice, on a patent they obtained from inventing an anti-theft device for automobile trunks. The patent, which they had shopped at all the big auto companies in Detroit, was initially refused. However, when a friend bought a new Chrysler, it came with a version of the Schimizzis’ invention built in. In the case of patent infringement, the brothers came out victorious — and it led to what they termed a deep understanding of the integrity necessary in art. “We don’t know any other way to be,” Greg Schimizzi added. The brothers still like to be hands-on with their station. They invented a new form of live streaming for the Web which does not require any downloading, and were both recently certified as broadcast engineers. “If we owned an airplane, we would learn how to fly it,” Greg Schimizzi said with a grin. Some of the programs, like the morning show “The Daily Buzz,” are not generated locally, but many of them — “American Dreams,” “The Real Hamptons,” and coverage of the Hampton Classic Horse Show and Hamptons International Film Festival — are. “We now have the ability to do live TV,” Ernie Schimizzi said with no small amount of excitement. His brother was also enthused at the prospect. A link to the past or a link to the future? Only the Schimizzi brothers know for sure. East Hampton - "Sneakin' In" - A new TV program will premiere on Hamptons TV®, on Monday, April 4 at 7 p.m. on Cablevision 78 and NYC Fios Ch. 14, (with rebroadcasts on Thursday, April 7 at 7 p.m. and Sunday at 1:30 p.m.). Local producer Frank Vespe announcee his new music program "Sneakin' In." Viewers will be treated to a front row seat and interviews video taped at the legendary Stephen's Talkhouse, the Hampton's most famous live music club. Vespe is an East Hampton producer whose love of music is the creative force for "Sneakin' In." "I've been shooting music videos at the Stephen Talkhouse for about two years and always brought my camera equipment through the back door, and it reminded me how I saw every James Bond movie for free on Steinway Street in Queens when one of my friends would buy one ticket and then let 10 of us in through a side door, and so I edited a version of my proposed show and gave it to the owners of the Talkhouse who really liked it, and then WVVH who also liked it. I shot Caroline Doctorow, who was really nice and very good. Her show is expected to be on next." Greg Schimizzi, Chairman of WVVH-TV stated " 'Sneakin' In' is a fresh, local production of the best music acts that come here to perform. We are proud of Frank and this latest 'Made in East Hampton' show." The premiere of "Sneakin' In" features "Thieves" with accomplished movie music composer Joe Delia and his group. Bill O'Reilly, who was a young foreign correspondent for CBS News, has invaluable advice for any journalist caught by unfriendlies in war zones. "Never get down on your knees and beg," the Fox News star recently told a talk-show audience on Hamptons cable channel WVVH. "The moment you show any weakness, you will be killed. Always look your enemies in the eyes and ask them politely, but firmly, to release you." This tactic, taught to him by a Jesuit priest in Central America, saved his life twice -- once in Argentina and once in El Salvador -- O'Reilly told Ingrid Lemme on her "American Dream" show taped at Gurney's Inn in Montauk. O'Reilly also had the audience enthralled with stories of his childhood in Levittown and praised President Obama as one of the toughest and best-prepared subjects he had ever interviewed. That hands-on closeness was magnified by the horses they saw on TV. Gene Autrey, Bonanza, Hopalong Cassidy, and Roy Rogers were only a few of the programs they watched in those early days. It was that fascination for ponies and those TV Classics as well as an anti-theft device which allowed them to start their company Video Voice (1976) followed by purchasing WVVH (1993), a Hamptons TV station. And with that purchase they were able to combine their fascination for horses with a sponsorship of the Hampton Classic Horse Show (1996) and the summer polo events (1997). That was when I first met the Schimizzi brothers because at the time I was handling the PR for the Hampton Classic. Today Hamptons TV is viewed by 5 ½ million people. It is seen on UHF (High Definition) Channel 50, Cablevision 78, Verizon FIOS Channel 14, Time Warner’s Video On Demand Channel 1111 and YouTUBE broadcast TV partner. The TV reach is New York, New Jersey, and Westchester. In addition, the extremely handy Schimizzi brothers “developed a system in 2004 which allows our station to be seen on any computer anywhere in the world by going to www.wvvh.tv. We have about 3 ½ million viewers from that alone,” added Greg. “To this day our TV stations broadcasts all of the legendary Classics,” admits the Schimizzi brothers, who still have a fascination for those timeless programs. Their dad Joseph, who died when the boys were 11 and 13 of a heart attack, had memories of horses during the War and was even trained as a saddle maker. He was in the Italian cavalry and so horses were an important part of his life. When Greg, who was born August 3, 1949, and Ernie (April 3, 1951) became adolescents they continued to ignite the flame their father had set. “We rode on the Jamaica Bay riding trails along the beaches. In those days it was magical that in Brooklyn you could do that. Afterwards we took the train home not smelling the greatest after a day of mucking around,” continued Greg while Ernie chuckled in agreement. Eventually the Schimizzi brothers went to college and earned degrees. Ernie “worked for a documentary film company. I was trained as a psychologist. I worked for 16 years with the Veterans Administration at Ft. Hamilton,” explained Greg. One day in 1971, when there was no such thing as home video, a primitive black and white TV camera and recorder were donated to the VA Jewish War Veterans. Greg was immediately drawn to the equipment. At that same time the Schimizzi brothers creativity was about to be unleashed. They developed an anti-theft device for trunks of cars that was patented and purchased by Chrysler. As the Executive Producers, they oversaw the entire project and along the way learned every detail of every crew member. “Partnered with MacMillan Publishing, we were the first to produce motion pictures for television in Canada. They had the literary rights and we made them into movies. “We sold not only our movies but also those made by other people,” explained Greg. And so life continued as their Video Voice grew and prospered. The day the Italian brothers drove to the Hamptons they were decked out in their three piece suits and leather shoes documenting the occasion. “We were traversing the ocean beaches and the farmlands with video camera in hand. It was like Lewis & Clark going to the hinter lands,” explained Greg. “Believe it or not on that first trip it was love at first sight and we bought a piece of property. We built a home within the year in East Hampton,” he continued. Then about a year later they were working on a motion picture for CBS that needed to be edited. In search of someone local they came upon LTV, the PBS studios, and were impressed with the cozy setup. From that day forward they devoted themselves to making LTV a more professional place. Then in 1993 something happened that would change their lives forever. “Ernie did research and found one TV license on LI and it wasn’t on the air,” but the gentleman who owned it wasn’t selling. Weeks later, “we got a call and the guy said I have to make payroll. If you can get down here with a check by 5:00 I will sell you the license.” Ernie rushed into the City and the rest is history. That was the beginning of their next learning curve. First getting approved by the FCC, then having to get the station up and running within a year. “We were always delusional in those days and figured it wouldn’t be that difficult because we sold to Television. How hard could it be?” commented Greg? 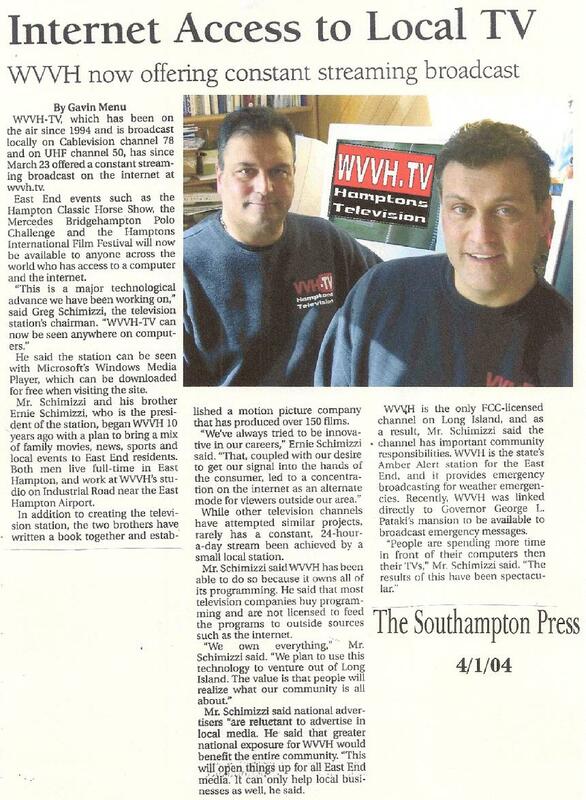 The brothers soon learned just how difficult a task this was but again they persevered and in September 1994 WVVH debuted with LTV as its home. The always delusional Schimizzi brothers were familiar with the Hampton Classic because starting in 1985 they would take their mother there. “We were fascinated by it,” explained Ernie. In those days they sat in the bleachers but, “one day there was a fundraiser for WLIW and Ernie won tickets to sit at their Hampton Classic VIP table on grand prix Sunday. Being up close to beautiful horses and riders made us pay more attention,” explained Greg. At that time I was working at the Hampton Classic and I recall the Executive Director Tony Hitchcock and I meeting with Greg and Ernie. The Schimizzi brothers clearly remember a statement that Tony made to them after their sponsorship was finalized. “Congratulations fellows you found a way of depleting your resources. Owning a TV station is like owning a horse,” Ernie laughingly remarked. The Schimizzi brothers asked me if I could set up some segments and be the on-camera reporter. Those segments aired for a few years but before long that would expand. In 1996 Cablevision was installing fiber optic throughout the East End of LI and they had an opportunity to purchase a dedicated cable of fiber from the Hampton Classic Grounds to their studio in Wainscott. It would only be in use this one week every year but it meant bringing the Hampton Classic live to their viewers. They asked if I would host the show and I suggested that Ernie and I do it together. When you speak to Greg and Ernie you realize just how in sync these two brothers are. They often finish each other’s sentences and are not afraid to purport their obvious love for each other and joy at being able to work together. And if you ask them about their daily routine, there is none, other than getting up around 6:00 a.m. every day. Those who know Greg may not know that he likes to paint and sculpt, while Ernie is color blind. “Greg is color TV and I am black and white.” And while Greg only does his artistic projects occasionally whatever he starts, he finishes, complete with frame, in one day. While they both enjoy the Hamptons, they also enjoy their homes in Brooklyn and they garden. “We still consider Brooklyn our home and we love everything about Brooklyn, from walking to exploring. That is something that we will forever be a part of although we also have this Hamptons identification,” commented Ernie. They were recently in Hamptons Magazine’s list of the 600 most powerful people in the Hamptons. Yet no matter what we talked about there continued to be themes that repeated themselves. To begin with it was obvious they love to work because any answer would always lead back to work even if the question didn’t relate to it. It was also clear that family and honor are everything to these men. The whole family including Greg’s wife, who is a world class editor, is involved with the business. “It’s a hands-on family affair,” admits Greg. “We are very proud of what we have accomplished because we didn’t sacrifice who we are and who we want to be. And this is a business where sometimes people try to fulfill something that is not attainable. But above and beyond we’ve always been the good guys from Brooklyn and our word is our bond. We give you a handshake on the telephone and that is as good as a written contract,” said Ernie. My last question to the Schimizzi brothers was brief and Greg answered first. His favorite color is blue, favorite word is love, least favorite is prejudice and what he loves is justice. When it was Ernie’s turn he said “ditto. It begins and ends there because we are totally in sync.” Even when they go to the doctors their vital signs are all the same. “And we are proud of it,” admitted Ernie. “There are times when people say, I want to be my own person. No, not here, I’m proud of my brother and find his sensibilities parallel mine,” commented Ernie. Ingrid Lemme was taping her hit TV show "American Dream," which is produced and directed by the talented brothers, Ernest and Gregory Schimizzi. The show zeros in on heritage, family, and the dreams of the successful and how those dreams became a reality. 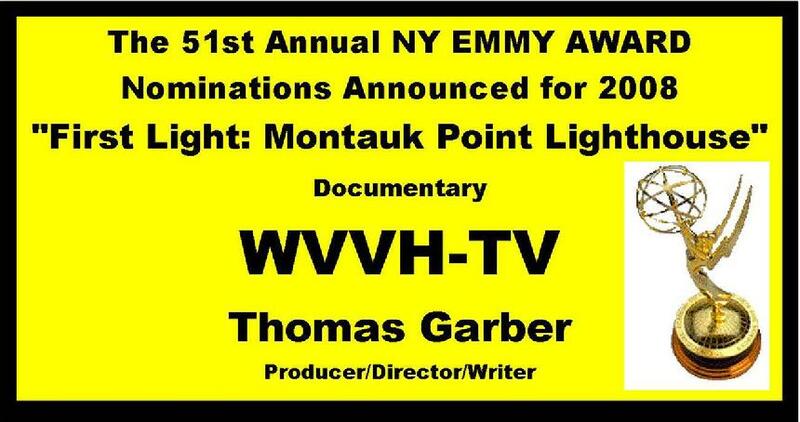 The show is shown on WVVH Hamptons TV (channel 78). Last Saturday at Gurney's Inn and Health Spa Ingrid was all smiles during the eleven shows she was taping, yes that's eleven, only stopping to have a quick lunch. I believe the show is the best of its kind out on the east end of Long Island, and is telecasted into over 5 million homes in the tri-state area. This award winning show showcases the interviewing talents of Ingrid Lemme, and watching Ingrid tape these shows is itself a story as she proves that although taping the show is work, she truly loves meeting people and hearing their business, personal stories and of course their dreams. Her first show started at 9:30 a.m. with Lou Hammond, a public relations industry legend. Then she was off to the races. I was fascinated to learn from guest Michael White, the Executive Director of the Long Island Planning Council, that Suffolk County is the largest and leading agricultural county in New York State. His ideas about fishing quotas, development in the county and environmental issues had me totally captivated. Publisher Joseph Louchheim was also dynamic as he explained his views on publishing. Mr. Louchheim's seamless, style is very suitable for television. Edward Breem is the co-author of Lucky Eddy a book about his dad Congressman Edward Breen. He brought amazing photos his dad had accumulated of people from President Kennedy in an Ohio Hotel to a striking Amelia Earhart. This is a show you should watch. If you love late night Hamptons or music, Nancy Atlas is your person. In taping her show the very upbeat, energetic Montauk resident was totally entertaining, whether she was talking about her music career, being a mother, or the advertising on air spokesperson for Winn Dixie in Florida for the last three years. Nancy, who took her stage name from the novel Atlas Shrugged, went to college in England where she studied art and didn't actually pick up a guitar until she was 21, although she played other instruments like the viola. Nancy is fun to watch and is always interesting as she has a way of being cool with an authentic Long Island flair. I admit I enjoy her work. Editor-in-chief Donna Halperin told us about the world of cosmetic surgery, maintaining your looks, liposuction, and other things done today besides dieting. Jill Nicolini a news and anchor at WB11/PIX was dazzling in a yellow dress that showed off why she is also a model. She was charming and disarming with a beauty that was not only skin deep. The camera seemed to love Jill and you will to if you watch this episode. Later in the afternoon Ingrid was scheduled to interview Paul Sladkus, the Good News Broadcast President, Cate Dolan, B.E.S.T. President, Tom Clavin, author of Last Stand Fox Company, as well as being a local Hamptons writer of distinction, one I admire and look up to. Her last show was Dan Fryda, Spa Technologies CEO. But the real star of the show is Ingrid Lemme, the charismatic woman who is the Gurney's Inn Director of Marketing and Public Relations. She makes guests laugh and feel at ease so that they unwind and tell great stories that makes great television. Ingrid also takes amazing photographs, many that end up on the covers of local magazines, pens a local column and produces a publication in North Carolina, all the time being a loving mother and Sunshine Lemme's wife. The show appears on different channels in the tri-state area and plays many times a week. In Montauk it's on channel 78. Often overlooked on stories about this show is the work of Ernest and Greg Schimizzi, who also own the station. They are hard working dedicated modest brothers who exemplify what class, citizenship and integrity is all about. If you get the chance, you should check out some of the good and hard working people that appear on the show. You aren't going to want to miss seeing people of interest tell their story. SOUTHAMPTON – WVVH-TV is going regional. 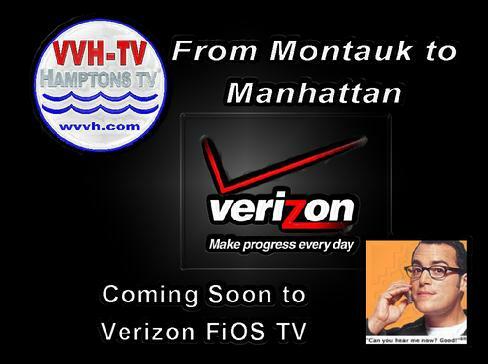 The small Hamptons television station, which is available on UHF channel 50 and on Channel 78 on Cablevision’s East End system, has struck a carriage agreement with Verizon’s FiOS television. Executives hope the deal will give the station the exposure it’s craved since Cablevision first added WVVH to its East End service in 1995. WVVH is also in talks with Time Warner Cable, the dominant cable provider in Manhattan and Queens, to carry the station on its New York City systems. On the other hand, Cablevision has not added it to any of its non-East End systems. “We’ve always been willing to expand on its platform, but it hasn’t happened,” Schimizzi said. The station is not available to DirecTV customers. WVVH carries various sports and entertainment programming, including Canadian Football League and American Hockey League games. It also carries the Hamptons Classic Horse Show. Its news division covers the East End. The station is a finalist for a Press Club of Long Island award. The PCLI is holding its annual awards gala on June 8.